It was several years in the making, but early 2017 saw the release of Valerie Teicher's debut album as Tei Shi, Crawl Space. With it came the transformation of a young new artist finding her sound to a confident musician who revels in the comfort and courage of their evolution. The question, then, was would Teicher's live shows reflect that evolution? The newly minted Capital Ballroom played host to the singer's Victoria show last night (October 11). As the lights slipped down, a guitarist, drummer and keyboardist/synth player stood solemnly on stage, heads bowed, while an intro rippled over the crowd. Like puppets in waiting, they all launched into "How Far" off Crawl Space, bass outputs lowered to a delectable, organ-rumbling level. It was an ideal song to kick off with, its smoky gait slowly adding layers of sound and allowing Teicher to show her vocal range. Second up was "Baby," one of the airiest tracks off the new album, though it was given crucial weight during the show, the live performance flushing out its potential. Many of Teicher's older tracks have the potential to burn out on stage given their apprehension, but her live show proved their strength, as she displayed a confidence and handle on her art that seemed lacking on her previous EP releases. After asking the crowd to come closer for a more intimate experience, a technical glitch set the act back as Teicher tried to get a side mic and mixer up and running. She took the opportunity to relay her experience of growing up in Vancouver, and the dreaded ferry ride over to the gig that night. Once things were up and running again, she launched into "Creep," with live saxophone filling in the song's end, lending a richness to the track. And as the opening notes of "Keep Running" plinked down, the crowd attendance seemed to suddenly surge, as fans pulled in close to feel it better. The show proved Teicher's ability to transition her older material into the realm of her new output, the live instrumentation heightening and embellishing the songs. Her release history shows a pattern of growth, but her live performance gathers all of her sounds and unifies them. 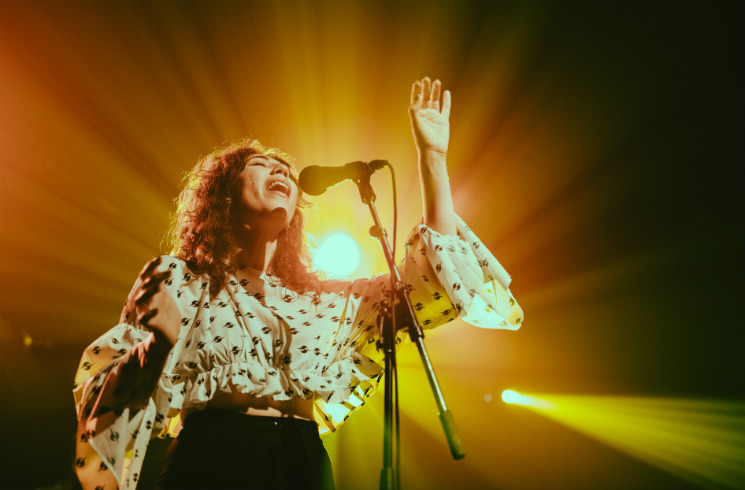 The entire set struck just the right balance between intimate and high-energy, and positioned Tei Shi as a firecracker, just waiting to go off onstage.